Alex Gibney, who brought us the Academy Award®-winning Taxi to the Dark Side and the Academy Award® nominated Enron: The Smartest Guys in the Room, now focuses his attention on the story of lobbyist Jack Abramoff. From Indian casinos and Chinese sweatshops to Russian spies and a mob-style killing in Miami, CASINO JACK and the United States of Money is at once a colorful tale of international intrigue and a story of the corrupting role that money plays in our political process. 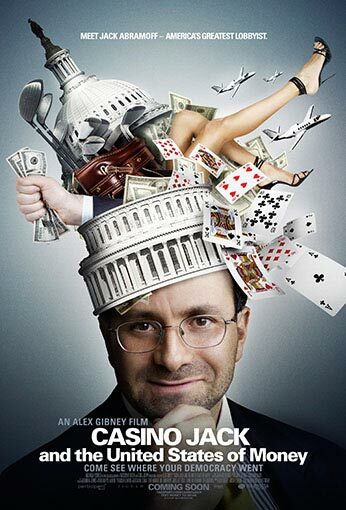 By following ongoing criminal investigations – including the indictments of federal officials, staffers and congressmen – and inquiries into the day-to-day business of favor-trading in our nation’s capitol, the film shines a light on the way that politicians’ desperate need to get elected – and the millions of dollars it costs – may be undermining the basic principles of American democracy.